30 D I V E R S I T Y W O M A N W i n t e r 2 0 1 8 d i v e r s i t y w o m a n . c o m Boone Isaacs and her team did find a way. It was for successes like those that in 1997 New Line Cinema hired her as head of its marketing department. She was the first African American woman to run a stu- dio marketing department and the second African American, after her brother. B oone Isaacs has been a member of the public relations branch of the academy since 1987, and an elected member on its board of governors for 20 years. When she was encouraged by her fellow board members to run for president in 2013, she initially dismissed the idea. en she thought, "Why not me?" e academy thought the same. at year, she was elected to the first of four one-year terms. She had a full agenda, starting with diversifying the academy. As the academy gently nudges the mo- tion picture industry, the more diverse its 17 branches will become and the more likely that more films will feature diverse casts and directors, and accordingly they will be nominated for the top awards. Perhaps even more important, a more diverse academy means that members are recommending and hiring talented diverse cinematographers, directors, edi- tors, and publicists—broadening the di- versity of the industry as a whole. "e academy plays a leadership role in the industry, so changing the academy meant changing the industry," says Hud- lin. "[By pushing for diversity] Cheryl was reminding members that we are not pas- sively voting on what are the best mov- ies—which is the public perception of what we do—but our real role is to set an example on how the industry must change to reflect society." Boone Isaacs decided that one way to increase academy diversity was by in- creasing the number of people invited to become members. In 2016 alone, it invited a record 683 people to join its ranks, more than doubling the number who were invited the previous year. e new invitees were 46 percent women and 41 percent people of color. "My goal in terms of diversifying the 17 branches of the academy was bringing in new talent," says Boone Isaacs. "at meant convincing each of the 17 branch- es to examine their criteria and expand who is recruited to apply for member- ship. 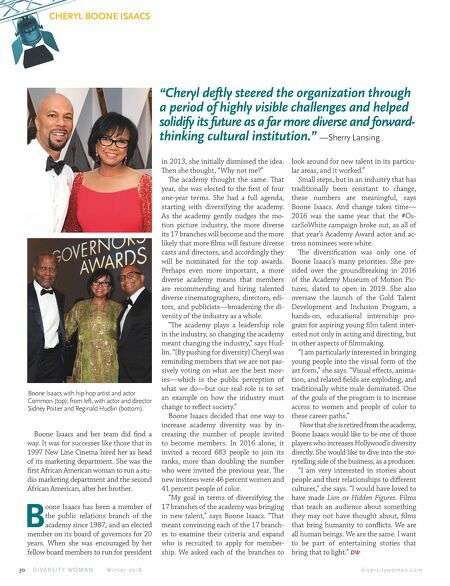 We asked each of the branches to CHERYL BOONE ISAACS look around for new talent in its particu- lar areas, and it worked." Small steps, but in an industry that has traditionally been resistant to change, these numbers are meaningful, says Boone Isaacs. And change takes time— 2016 was the same year that the #Os- carSoWhite campaign broke out, as all of that year's Academy Award actor and ac- tress nominees were white. e diversification was only one of Boone Isaacs's many priorities. She pre- sided over the groundbreaking in 2016 of the Academy Museum of Motion Pic- tures, slated to open in 2019. She also oversaw the launch of the Gold Talent Development and Inclusion Program, a hands-on, educational internship pro- gram for aspiring young film talent inter- ested not only in acting and directing, but in other aspects of filmmaking. "I am particularly interested in bringing young people into the visual form of the art form," she says. "Visual effects, anima- tion, and related fields are exploding, and traditionally white male dominated. One of the goals of the program is to increase access to women and people of color to these career paths." Now that she is retired from the academy, Boone Isaacs would like to be one of those players who increases Hollywood's diversity directly. She would like to dive into the sto- rytelling side of the business, as a producer. "I am very interested in stories about people and their relationships to different cultures," she says. "I would have loved to have made Lion or Hidden Figures. Films that teach an audience about something they may not have thought about, films that bring humanity to conflicts. We are all human beings. We are the same. I want to be part of entertaining stories that bring that to light." 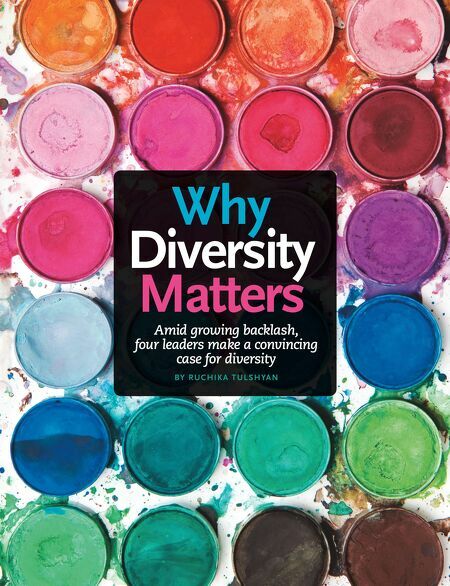 DW "Cheryl deftly steered the organization through a period of highly visible challenges and helped solidify its future as a far more diverse and forward- thinking cultural institution." —Sherry Lansing Boone Isaacs with hip-hop artist and actor Common (top); from left, with actor and director Sidney Poitier and Reginald Hudlin (bottom).